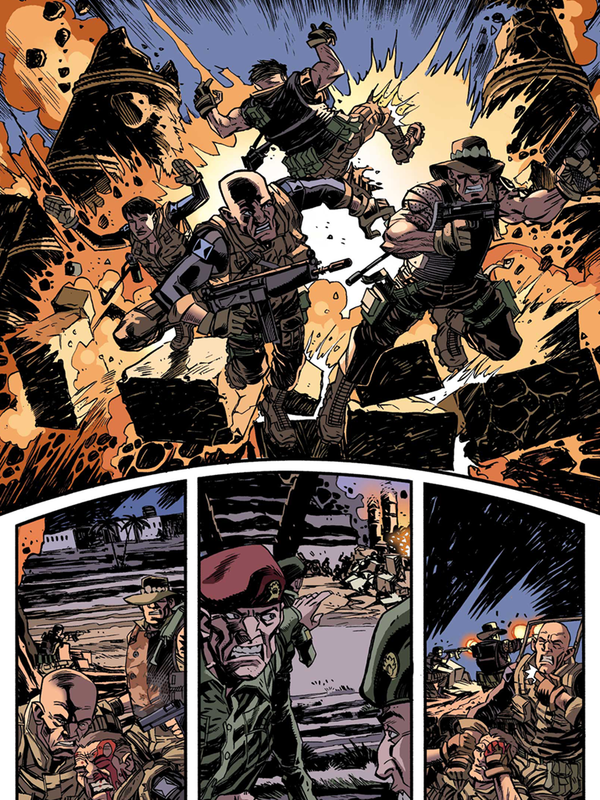 Scottish artist Cam Kennedy has had a long and distinguished career in comics having drawn British characters as well known as Judge Dredd and Rogue Trooper while also covering Star Wars for Dark Horse and The Punisher for Marvel in America. As well as using his Scottish heritage in John Wagner's Punisher - Blood On The Moors, and of course in the Kenny Who? stories in Judge Dredd, he also was the artist on the two Alan Grant adaptations of Robert Louis Stevenson's novels, Kidnapped and the Strange Case Of Dr Jekyll And Mr Hyde. Indeed his entire set of painted art boards for Kidnapped, as well as his preparatory sketches, were purchased by the National Library Of Scotland in Edinburgh and were displayed to the public during their 2008 exhibition Local Heroes: The Art Of The Graphic Novel. 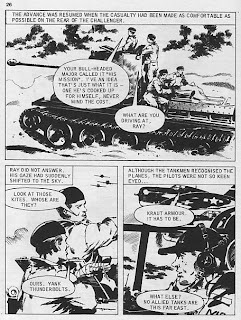 Amongst his earliest work were the Commando comics that he drew some forty years ago. 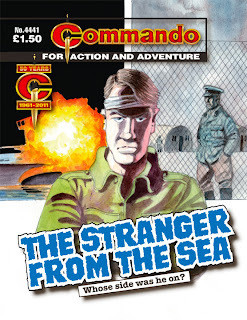 This weekend Cam Kennedy is appearing at the Dundee Comics Day where he will be giving a talk on his career as well as being reunited with some of the pages of his original artwork from his very first issue of Commando, number 448 Come Out Fighting, which was originally published in December 1969 almost ten years before his art first appeared in 2000AD. 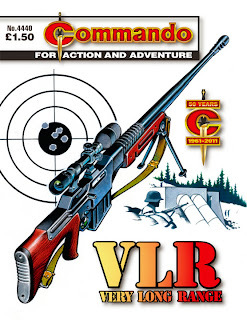 With thanks to Commando editor Calum Laird, downthetubes presents a list of Cam Kennedy's 25 issues of Commando taken from the original Commando office records. There are more details of Cam Kennedy's career on his website. Seeking to boost subscriptions to Star Wars: The Clone Wars Magazine, Titan Magazines is offering US fans a digital sampler of the title (but UK readers can view it, too). 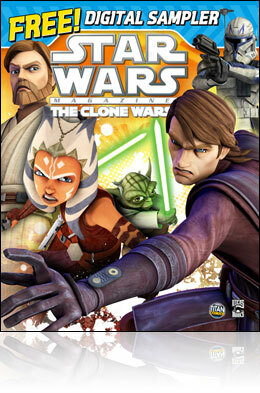 The title is packed full of incredible features about the hit animated show, as well as brand new and exclusive Star Wars: The Clone Wars comic strip stories. STRIP Magazine Issue 1 may not be on sale in good UK comic shops until next week (Wednesday 2nd November) but the digital edition - which has the same cover price but obviously doesn't include the giveaway Mirabilis poster - is on sale now as an iPad comic. 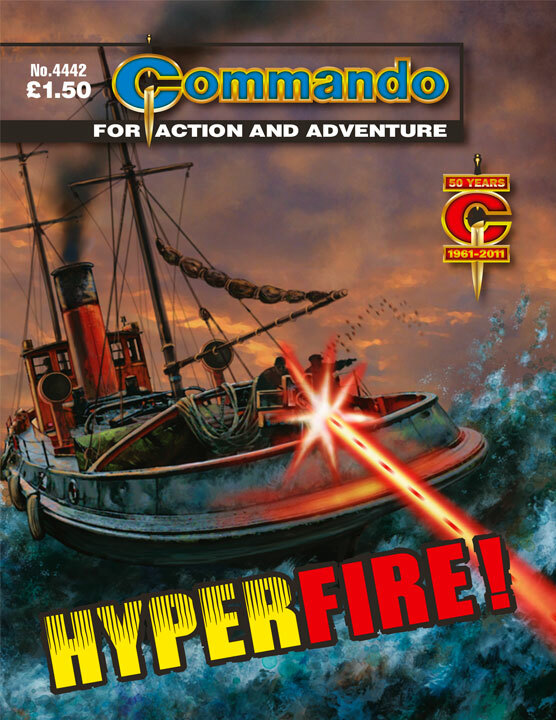 The digital edition is the result of a partnership between new graphic novel and magazine company Print Media Productions and Britain's mobile comic publisher ROK Comics. The first issue is now available worldwide for iPad from the Apple iTunes store (the print edition is only available in the UK). STRIP Magazine is an adventure anthology comic featuring some great art and stories from some brilliant creators including PJ Holden (Judge Dredd), John McCrea (Hitman, The Boys), Michael Penick (Insurrection), John Ridgway and many more. Offering a range of strip stories, comics news, interviews and features, plus a fully re-mastered version of the classic British comic strip Hookjaw, this is a first issue you will not want to miss! ROK Comics partnership with Print Media Productions is one of several new agreements with comics publishers and comic creators. These include the release of an iPad edition of The Iron Moon, a steampunk graphic novel created by acclaimed film writer Stephen Walsh and veteran British artist Keith Page. A special 'prequel' strip for The Iron Moon appears in STRIP Magazine #1. 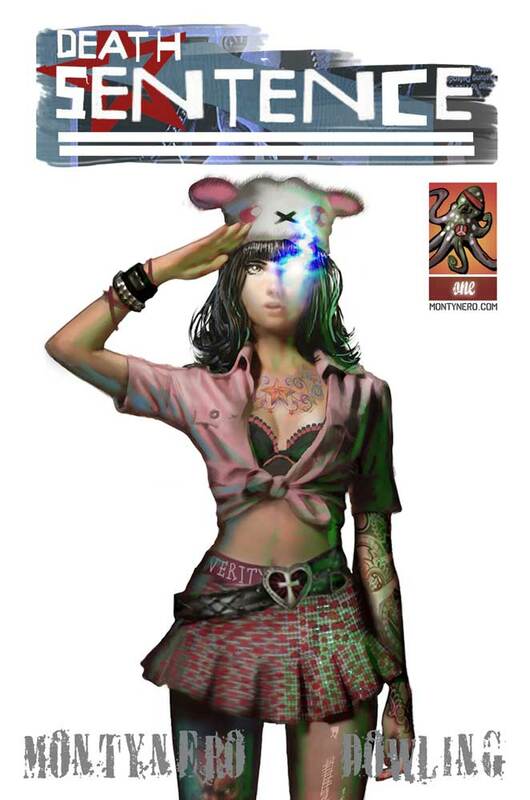 ROK Comics recently launched its first fully originated comic, TEAM M.O.B.I.L.E. which is initially being published as a weekly web comic (at http://www.theteammobile.com/), followed by roll out on iPad and other devices. ROK Comics has previously published creator-owned and licensed strips for mobile, with three iPhone apps – Ligeia the Vampire by Rodrigo Diaz Ricci, The Mobile Gospel by Rich Diesslin and Madd Science by Steve English. Further iPhone and iPad apps, working with a number of different publishers, are in development. As STRIP Magazine's editor, I'm delighted that thanks to the iPad, we're able to offer STRIP Magazine worldwide (thanks also to the creators who feature for their support). This is our first stab at a digital version of the magazine and we're hoping that later issues will take further advantage of the opportunities offered by the iPad platform. 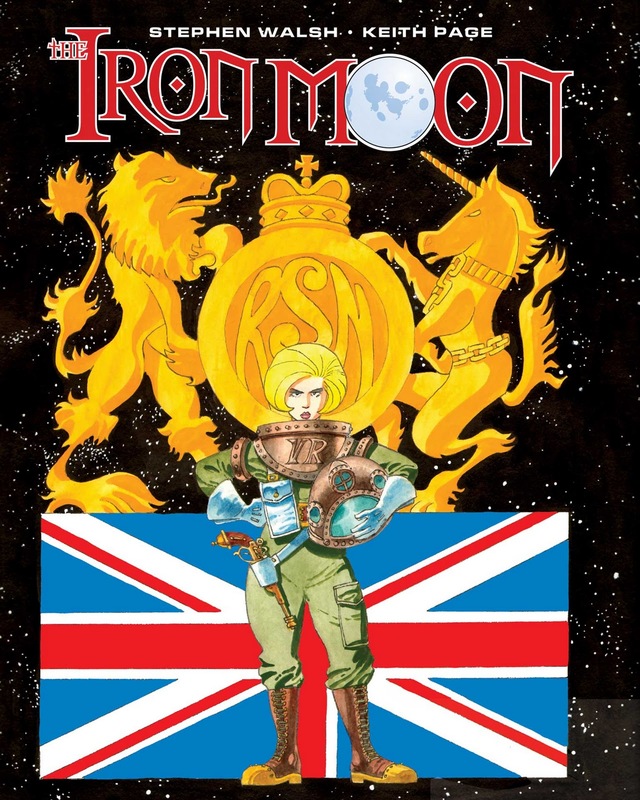 Britain's dedicated mobile comics publisher ROK Comics, has just launched an iPad edition of the steampunk graphic novel The Iron Moon, a creator-owned comic story by acclaimed Commando comics artist Keith Page and film writer Stephen Walsh. 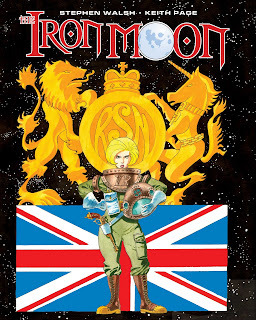 Described as 'Rorke's Drift in Space', The Iron Moon is a fast-paced steampunk-inspired adventure starring no-nonsense adventuress Charlotte Corday and is now available worldwide for iPad from the Apple iTunes store. In the story, the twentieth century is just around the corner and Queen Victoria is hale and hearty as she heads into the second century of her reign. The British Empire stretches from the white cliffs of Dover to the red skies of Mars. Go-getting men and women of the imperial dominions flock to the colours, eager to make reputations and fortunes in the wilds of high space. Take lieutenant Charlotte Corday, for instance. Born in what used to be known as France, she has risen to prominence through the ranks of the Royal Space Navy and now finds herself up to her neck in her greatest escapade yet. Watch as she travels to the mysterious Iron Moon! Marvel as she grapples with a conspiracy that may see the galaxy plunged into war! Goggle as she meets new and strange races, both mechanical and biological! Ponder how she manages to put away so many cups of tea! And prepare to have your brain scrambled as she scoops us up and carries us to the very limits of this universe... and into the next! ROK Comics partnership with Stephen and Keith is one of several new agreements with comics publishers and comic creators. These include the release of an iPad edition of the first issue of the adventure anthology comic STRIP Magazine, published by Print Media Productions, which includes a special 'prequel' strip for The Iron Moon. Iron Moon writer Stephen Walsh has written multiple volumes of DC Thomson's Commando Picture Library, as well as the graphic novel The Acid Bath Case (illustrated by Kellie Strom). He co-wrote the feature films How Harry Became A Tree, released in 2001, directed by Goran Paskaljevic and the upcoming Where The Sea Used To Be, directed by Paul Farren. 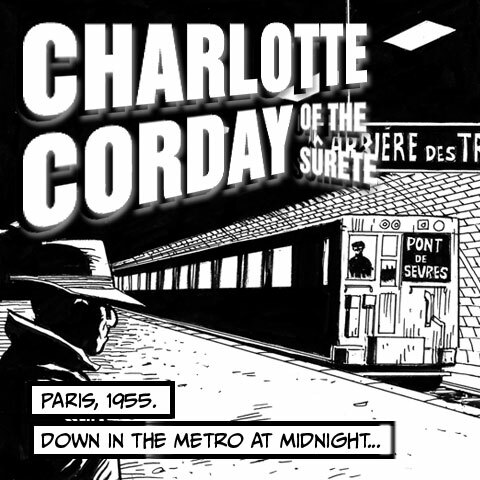 He's currently working on a documentary about John Ford with the director Sé Merry Doyle, as well as preparing further adventures of Charlotte Corday with Keith Page. This isn't, of course, the first time Charlotte Corday has featured digitally. 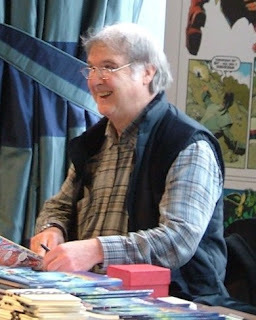 Keith Page previously created two adventures which have been offered on mobile phones and published another strip, Witchcraft Street, as a web comic. A variety of Keith's work can be seen on www.keithpageukcomicsartist.blogspot.com. ROK Comics recently launched its first fully originated comic, TEAM M.O.B.I.L.E. which is initially being published as a weekly web comic (at www.theteammobile.com), followed by roll out on iPad and other devices. The company has previously published creator-owned and licensed strips for mobile, with three iPhone apps – Ligeia the Vampire by Rodrigo Diaz Ricci, The Mobile Gospel by Rich Diesslin and Madd Science by Steve English. Is the ideal toy for your child this Christmas really a battery operated dog that poos? What happened to the rocking horse, the educational abacus, the classic wooden toy, the much loved train set or the ever so traditional Jack in a box? Why do the toys of today require multi-coloured plastic structures, countless functions and noises going off left, right and centre? Supporters of the Slow Toy Movement, which launches today, say it’s time for a change thanks to some of the most significant individuals in the toy sector. Maybe they'll also be backing the buying of a Beano annual or two along the way. The Slow Toy Movement, is a concept that aims to promote well made toys that are sourced ethically and leave plenty to kid’s imagination. Banished are the fast paced, 84-function plastic monstrosities that top the Dream Toys predictions for this Christmas announced this week by the Toy Retailers Association, which include the "Doggie Doo" game, Mattel's Fijit Friends Interactive Figure and Hasbro's Star Wars Ultimate FX Lightsaber . (Personally, I think I'll give them the light saber, the latest variant on a Star Wars staple). The Slow Movement is, say its backers, set to be the next big cultural movement for the toy industry. Much like what Carlo Petrini did for the food industry with his Slow Food Movement that defended good food and the enjoyment of eating back in 1986, this campaign in much the same way aims to support and promote toys sourced ethically and toys that let the child develop at their own pace. Children should never be in a race to talk or walk first, this is not a competition, campaigners argue. Development should be left to follow its own pace. There should be a time to play and a time to study, work and develop. “Our launch today is very much in response to the 2011 Dream Toys announcement where a plastic toy that poos made the top of the selection," says Thierry Bourret, Managing Director of Asobi Toys and the inspiration behind this concept, whose scorn is aimed at Ideal's "Doggie Doo " roll the dice game, centred on a pup that gobbles up all the treats and poops on the lawn. (If it happens on your turn then you better clear it up - the first player to scoop three poops wins). The game, Ideal says, will appeal to anyone with a cheeky sense of humour aged four and up but Mr Bourret seems to be having none of it. "This was held as, and I quote here: "amazing technological advancements from the toy industry. This doesn’t mean to say that the toys are ‘techy’; rather that technology has been used to enrich the whole experience of play." Wow, if this is technological advancement, I will eat my hat!" It should be noted that the Dream Toys Top 12 also includes some slower-moving toys such as the LEGO Ninjago Fire Temple which is pretty expensive but doesn't seem to be too 'techy' and Vivid Imaginations' Moshi Monsters Moshling Treehouse Playset . 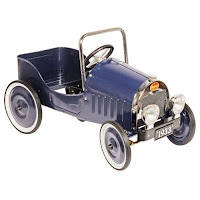 Asobi was set up in 2009 by owner Thierry Bourret, a father himself who was frustrated at being unable to find quality natural toys for his own son that looked good, felt good and had no batteries but were still fun to play with, Thierry began sourcing suitable toys to share with like-minded parents. He also wanted to demystify the belief that green toys are expensive. 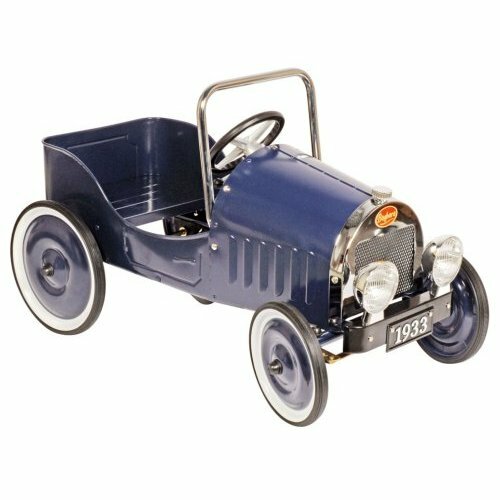 As a leading UK and European distributor of high quality toys that don’t cost the earth in more ways than one, Asobi stocks a fantastic range of products that are beautifully made and built to last including brands such as Baghera retro cars, Boikido , Calafant castles and more. Send your entries to thierry@asobi.co.uk by the 8th of November. Clearly mark in the title of the email "Slow Toys Nomination". The list will be published on the 9th November 2011 noon. 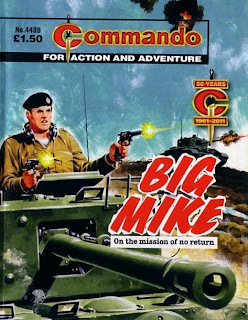 As Commando continues its 50th anniversary year, and its countdown to the reissue of number 1 in December, the current batch of Commandos reprints Big Mike, a story from 40 years ago and one of the earliest published comic strips by artist Cam Kennedy. It is the final days of WWII and British tanks are pushing forward into northern Germany. A troop of Cromwell tanks commanded by Major Mike Madden has been tasked with a mission so secret that Big Mike cannot even tell his crews that they are to push forward of the British lines to destroy a possible German nuclear research base at Ravensdahl Castle. Along with a single example of the more heavily armed version of the Cromwell called the Challenger, commanded by Captain Ray Colburn, Big Mike pushes his troop through enemy territory in an attempt to get to Ravensdahl before the Nazis move their new weapon. As Tiger tanks, German Home Guard units and even 'friendly' American fighter-bombers attack the rapidly moving column of tanks, Colburn gets suspicious of Madden's motives which are putting his men in greater and greater danger. Written by AC Allan with interior art by Cam Kennedy and a cover by Ian Kennedy, Big Mike was originally published as Commando 522 in January 1971 and then again in May 1981 as issue 1507 so for all the fact that this is the third edition of the story, it is thirty years since it has been reprinted as a comic. Indeed the most striking difference between then and now looking at the cover is that the sky background, always previously green, is now a more natural shade of blue. Allan's story is fast moving as the tanks attempt to capture or destroy the potentially nuclear tipped missiles before they can be used against Allied cities, while the human story of whether the crews can trust their commander, on what is effectively a suicide mission, is well handled. I also liked the fact that while the British Sherman tanks that carried the big 17pdr guns, the Fireflys, are well known, the story taught me that there were actually Cromwells modified to carry 17pdrs as well and that they were called Challengers. Indeed it is the single Challenger tank that shows off Cam Kennedy's attention to detail in his artwork as he accurately portrays it with six road wheels whilst the Cromwells have five. 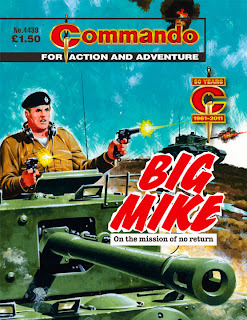 Big Mike was only the sixth issue of Commando that Cam Kennedy illustrated but it shows off his gritty yet accurate style that we have grown to know and love since this was first published in 1971. It is treat to see Big Mike again after all these years. 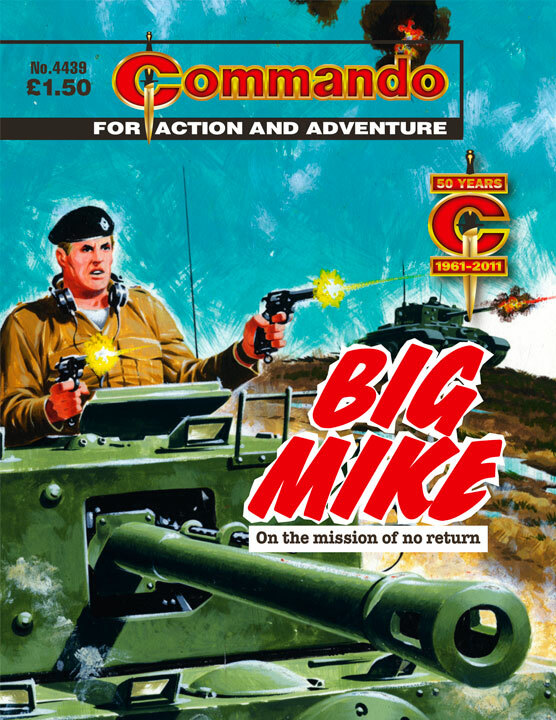 Commando 4439 - Big Mike is currently available at high street newsagents and costs £1.50. 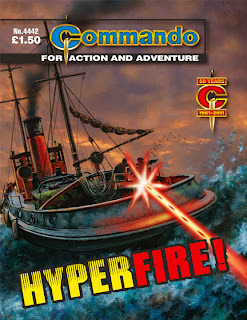 There are more details about Commando on the official DC Thomson Commando website and Facebook page. 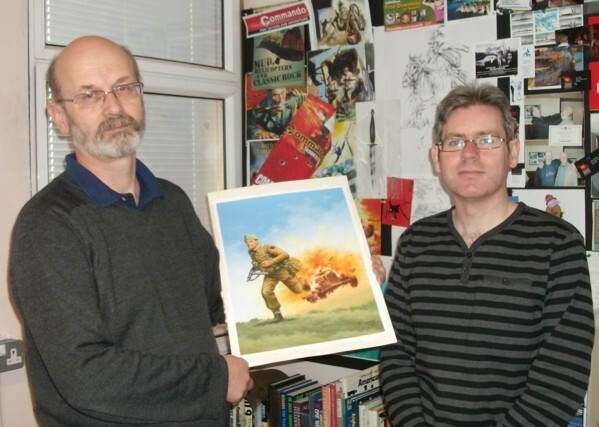 Cam Kennedy will be appearing at the Dundee Comics Day at Dundee University of Sunday 30th October 2011 which is also exhibiting a selection of original Commando artwork. There are more details of the Dundee Comics Day on the Literary Dundee website and more details of the Commando Battlelines exhibition on the Dundee University website. Described as "the best idea I've seen for a comic in years" and "Genuinely original," by none other than Mark Millar, the comic is about an STD that enhances your abilities but kills you in six months. It documents the chaotic final months of an artist, a musician, and a comedian who find themselves with unwanted super-abilities. Artists and writer Montynero creates 2d and 3d artwork and writes, mostly for computer games, and spend a bit of time each year teaching digital painting/3d modelling at computertrainingacademy.co.uk. Mike Dowling is a London-based comic book artist who has previously published work with Insomnia and Ubisoft, and was a regular illustrator on Torchwood Magazine from 2008 onwards. His first story for 2000 AD, ‘Six Brothers’ written by Alec Worley, came out in August 2011, progs 1743-5. He's been drawing ‘Rex Royd’, written by Frankie Boyle, for CLiNT magazine and is involved in several independent projects in development. downthetubes: What's the point of the comic? Montynero: To entertain, firstly, and then to explore some fine sequential storytelling. The idea's interesting enough, but really its all about how you tell the story. Mike and I both got into comics for the love of the medium, and its narrative possibilities - so we spend ages fine tuning the sequentials to make them as punchy and poetic as possible. But its commercial entertainment, not high art. downthetubes: Who are the characters? Montynero: Three twentysomethings. Verity's a graphic designer - tattoos - sexually adventurous. Weasel's an addict and a noted singer songwriter. Some call him a genius, others a talentless bullshitter. Monty's a movie star and comedian. They all react to the virus in radically different ways, and the conflict becomes explosive. downthetubes: How did it come about? Montynero: A reaction to life, really. I was driving home from a comic con, my wife was three months pregnant, and everyone was telling me my life would no longer be my own when I became a dad. So it felt like I only had six months to do something creative. I'm fascinated by the decadent lives people lead, and the nihilistic attitudes pervading Western culture, and we wanted to document and explore that. I mean, It's supposed to be entertaining, funny and irreverent - but by the end of the series you get a very clear idea of what we think about it all. Ultimately it explores the point of life - though you'll have to read the whole thing to get the big picture. downthetubes: When it coming out? Montynero: 2012. Though there are advance copies at Dundee Comics Day and Thought Bubble in Leeds in November. Advance purchasers get signed/ personalised editions - and their names enshrined on the Death Sentence website for posterity. (with thanks to Norman Boyd): The Comics Forum website (http://comicsforum.org) has recently had something of a makeover and now includes the addition of a new 'Scholarly Resources' section for anyone interested in the study of comics (accessible from the top of all pages on the website). This section also includes a newly launched Digital Texts archive, which offers freely downloadable texts of relevance to comics scholars - including a digital copy of the controversial UK Children and Young Person’s (Harmful Publications) Act, 1955, the genesis of which was discussed at length in Martin Barker’s A Haunt of Fears: The Strange History of the British Horror Comics Campaign (and is still in force). The digital text archive is currently in its launch phase and as such contains a small number of texts, but the creators hope to be able to expand this collection as time goes on in order to provide a useful centralised hub for freely available, open access comics scholarship. "We are particularly keen to feature previously unpublished material," says Forum manager Ian Hague, "or texts that have gone out of print, in order to help develop the breadth, longevity and sustainability of comics scholarship, and contribute to overcoming the sense of ‘reinventing the wheel’ that was alluded to in a post on the Comics Forum site by Randy Duncan and Matthew J. Smith in July of this year, and by Charles Hatfield in a post on the Thought Balloonists blog in September 2009. "We are also interested in publishing new material where it is available, with the hope that featuring such material on this website can help it to find a wider audience." If you are an author and you would be interesting in making your articles, books, dissertations, essays, fanzines, theses etc. available via this archive please contact me at this address or I.Hague@chi.ac.uk. Already available in the Digital Texts archive are Ian Gordon’s book Comic Strips and Consumer Culture 1890-1945 and Dan Raeburn’s series of critical essays published as The Imp (four issues). Ian is also planning to launch additional resources to complement the existing materials and would welcome some assistance in doing so. 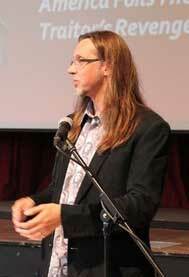 "Up to this point I have largely been running the website by myself, he says. "At present the situation is fairly manageable, but I would like to expand the site and the remit of Comics Forum as a whole if possible, in order to increase its usefulness to scholars individually and to scholarship as a whole. "At the moment I am looking to get together a larger team of people to help with the 'behind the scenes' aspects of the website and possibly the 2012 conference (depending on what format that takes next year)." • If you would be interested in getting involved with Comics Forum please get in touch with Ian via the email address above for more info. Experience working with the WordPress online service would be helpful but is not essential. 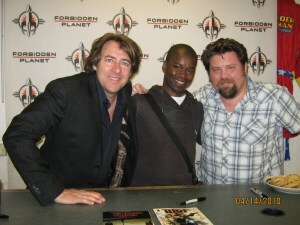 (with thanks to Barry Nugent) Turf witer and TV broadcaster and presenter Jonathan Ross has provided a special intorduction to Tales of the Fallen, the latest project set in the Unseen Shadows universe. "If, like me, you like rip-roaring testosterone fuelled pulp fiction," enthuses Ross, "with soldiers, and mysteries, and all round weird stuff in, then this is the book for you." "The above sentence is a very small portion of a special introduction," says Barry, who's also co-founder of the smashing cult news site Geek Syndicate. "As most of us in the comic world know Jonathan is also a huge comic fan and has recently become a comic writer with his Turf mini series published by Image Comics. "I approached Jonathan a while back with Tales of the Fallen and asked him if he would be interested in writing the introduction for the anthology," he reveals. " To say I was pleased when he accepted is a little bit of an understatement. Since then I’ve kept Jonathan’s involvement under wraps, from pretty much everyone on the creative team, as I wanted this to be one last surprise before the book went off to the printers." Tales of the Fallen offers the stories of murderers, martyrs and mercenaries in the no-man’s-land between adventure and crusade – soldiers of fate and fierce honour, bound together in mystery, darkness and blood. Their enemies are shadows haunting the outermost borders of a darkening world, and as night approaches the shadows grow long. 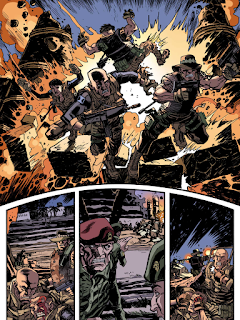 Creators on the four stories are Richmond Clements, Cy Dethan Pete Rogers and Dan Thompon (Writers); Conor Boyle, Rob Carey and Steve Penfold (Art); Gat Melvin, Roy Huteson Stewart and Vicky Stonebridge (Colours); Paul Mclaren and Nic Wilkinson (Lettering). As the 50th anniversary year of the Eagle Award winning Commando continues apace, there are currently two different free Commando art exhibitions on in the UK. Dundee University has the Commando Battlelines exhibition while London's National Army Museum has the Draw Your Weapons exhibition. Commando cover artist Ian Kennedy painted a special Commando image to promote the National Army Museum exhibition which has been used on all its advertising, including posters on the London Underground, and editor Calum Laird and chief-sub Scott Montgomery are shown above with Ian's original artwork. 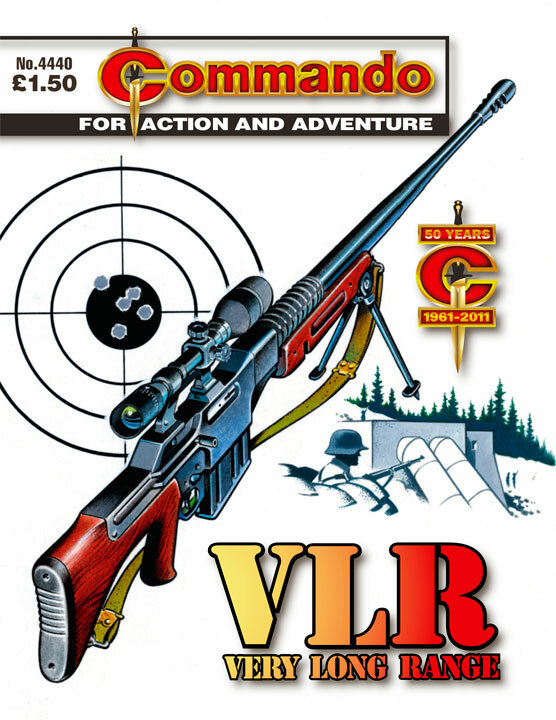 In the meantime Commando continues to be published at four issues every two weeks and the current batch are available in newsagents from today. When the crew of a German Mk VII U-boat picked up a body floating in the icy North Sea they were amazed to find that somehow the man was still alive. When the stranger came round, though, the mystery man had no memory of who he was or how he’d got there. It seemed he could understand both German and English, but whose side was he on…? When the might of the German Blitzkrieg overwhelmed Poland at the beginning of World War II, Sergeant Adem Kozcki of the Polish Army found himself on the run with a survivor from the staff of a destroyed weapons development facility. They had reason to run, for a ruthless SS weapons expert was on their tails and would not stop until he found them. Why? Because he was after two highly-experimental machine guns rescued from the facility — one of which had a devastating firing rate of 500 rounds per second. This wasn’t rapid fire. This was HYPERFIRE! Black Hearted Press is a new small press publisher in Glasgow run by names familiar to those who attended the Glasgow Comic Con during the summer. The School Of The Damned is their third comics title to be released. It is 1936 and in eastern Europe German soldiers approach a school run by Count Orlock. 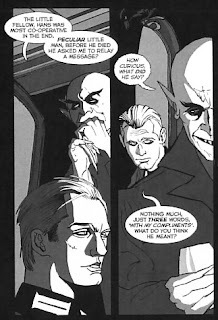 The Count invites Major Von Stroheim in to discuss the location of Gabriel Utterson, an Englishman that the Germans have been hunting for through the travelling freak shows of Europe. However as some of the school's pupils guide the soldiers through the dark marshland towards Utterson's cottage, the Nazi's discover that there is more to the school than they had been lead to believe. Glasgow has something of a reputation of producing small press titles themed around drugs and titillation, themes that culminated in the national distributed magazine Wasted. So it is good to see publications from the likes of Team Girl and Black Hearted Press that break the mold. 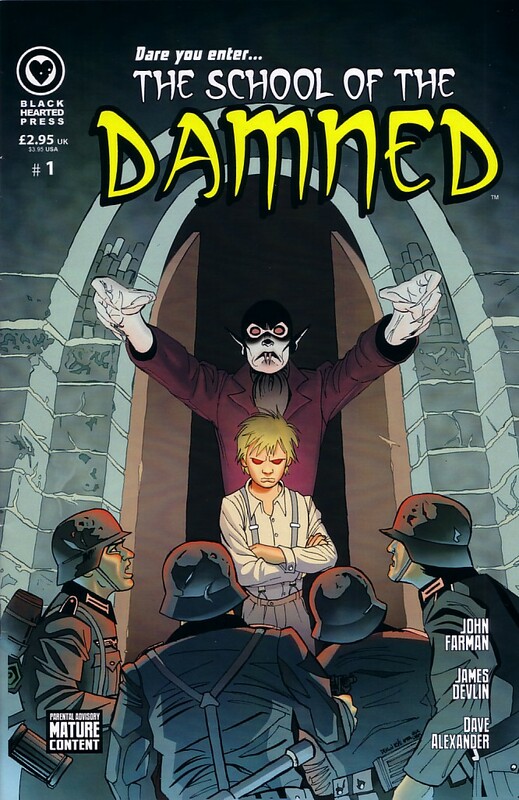 In The School Of The Damned writer John Farman has taken Xavier's School For Gifted Youngsters, The League Of Extraordinary Gentlemen and 1920s and 30s horror movies and given them a good shake together, added in some Nazis for good effect, and produced a title that deserves attention. 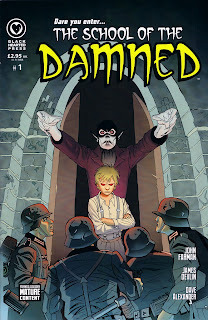 Run by the lead character from the 1922 Nosferatu film, the school includes a werewolf, gargoyles, Medusa, the boy Molock as seen on the front cover, plus Victor Frankenstein and his latest creation, Jenny. There is a lot more going on here than can be fitted into 19 pages of a single issue with some characters only getting a few fleeting panels, but the interactions of those barely seen characters hold out hope for the the already planned continuation of the title. The comic also has a short four page backup story, with art by Dave Alexander, giving a little more information about Gabriel Utterson, a character from Stevenson's Dr Jekyll and Mr Hyde, plus a page of the writer's thoughts on the overall concept. James Devlin's moody cover with its subdued colours stands out while his internal artwork is in greyscale which suits the 1930s horror movie feel of the book very well indeed. There is little grandstanding inside with the few splash panels used to good effect as the art gets on with telling the story while the action sequences skew their panels and most pages have black gutters just to add to the overall effect. I have a great fondness for the old school horror films and so approached this title with a little trepidation. However The School Of The Damned proved to be an entertaining read and I look forward to seeing more of it and its characters in the future. • There are more details about ordering The School Of The Damned on the Black Hearted Press website and Facebook page. • There will be an official launch of The School Of The Damned at Glasgow's City Centre Comics in Parnie Street near the Tron Theatre on Sunday 30 October 2011 running from 7pm to 10pm with writer John Farman and artist James Devlin. There are more details at the event's Facebook page. 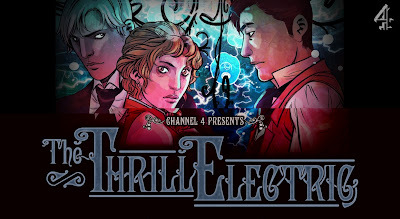 Channel 4 Education has announced details of its launch of The Thrill Electric – a 10-part enhanced comic series written by Leah Moore and John Reppion, designed by Emma Vieceli, illustrated by the all-female comic book studio Windflower and produced by Hat Trick Productions. It's a story in the Victorian era that demonstrates the extraordinary parallels between the telegraph age and the internet age. Working with the very best names in the British comic’s industry and award-winning digital agency Littleloud, The Thrill Electric tells the story of Emily Bagley, a sassy and intelligent young woman who breaks with tradition and becomes a telegraph worker. In addition, there’s a whole host of characters to follow through the series as they tackle issues of sexual identity at a time when it was illegal to be gay; trying your best to better yourself in the face of peer pressure from gangs; the dangers of creating a false impression of who you are online; and female issues of body image and sexual inequality. And for eagle eyed readers, there’s a secret storyline hidden in the code. The Thrill Electric is written by comic writing duo Leah Moore and John Reppion, designed by Manga aficionado Emma Vieceli, drawn by the Windflower team and produced by Tracy Beaker and Young Dracula’s Mia Jupp. “When we discovered that the Telegraph system in the Nineteenth Century was to all intents and purposes a Victorian Internet, it really caught our imaginations,” says Leah Moore. “A young woman could, with the right skills, join a predominantly male workforce and become part of the rapidly growing online international community. The Thrill Electric tells its story in the form of an enhanced comic with layered panels and atmospheric animations and comes packed full of contextual issue-led information threaded throughout the story. "Littleloud created the technical framework and animations, with a view to explore and push what comics can be in the digital age," explains Darren Garrett, the agency’s Creative Director, "and how they can connect with new audiences. The technical framework we've built is all about exploring those possibilities and giving writers and artists tools to do this." • The Thrill Electric will be released weekly from 27th October 2011 and experienced via a bespoke comic reader available online at this address www.thethrillelectric.com and on iPod and iPhone devices. 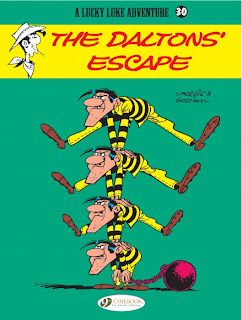 Cinebook reaches their thirtieth Lucky Luke book with the first English translation of The Dalton's Escape written by Rene Goscinny and illustrated by Morris. Hearing that Lucky Luke is close to their jail, Joe Dalton convinces the three other Dalton's to escape and they go on a rampage through the nearby towns before settling into their hideout to plot revenge on Luke. 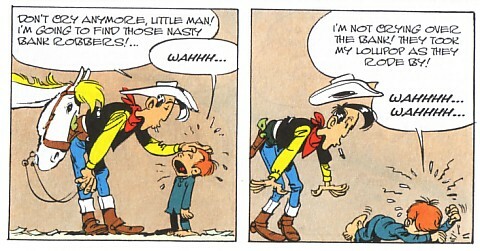 In the meantime as Lucky Luke follows their trail, he soon realises that the Dalton's revenge to is put up fake wanted posters about him that turns the nervous townsfolk against him. Luke's only recourse is to find the Dalton's on his own but all does not go quite to his initial plan. This was originally printed as L'Evasion Des Daltons in the weekly Spirou magazine in 1958/59 and then published as an album in 1960 and, while it may be over half a century old, it doesn't show its age at all. 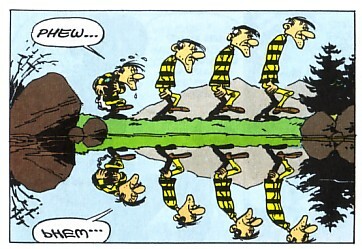 Morris and Goscinny, as ever, have fun with the different heights of the Dalton's be it with the depth of the river that they hide in after their initial escape or the different heights of the wanted posters they put up when trying to frame Lucky Luke. However my favourite panel in the whole book is one that doesn't even need to be there, from a plot point of view at least, and shows Morris' playful use of the comics medium as he illustrates the Dalton's walking past a still lake which has the reflections of the four brothers and of the landscape around them as well as of the single speech balloon. It doesn't need to be there, but it is charming that it is. The plot falls into two distinct parts, Luke's initial hunt for the Daltons and then the more unusual section with Luke as their not so reluctant prisoner. Indeed both parts go against type with those wanted posters making Luke the bad guy, in the eyes of the town folk at least, while the second part shows Luke's cunning as, despite being a prisoner, he twists the Daltons around to doing what he needs them to do. Perhaps the funniest moment of this section is when Luke gets three of the brothers knitting until Joe puts a very red-faced stop to such craziness. 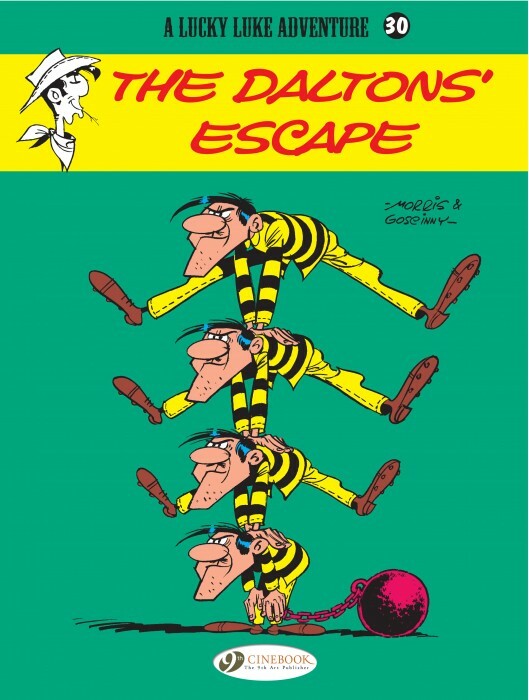 Lucky Luke - The Dalton's Escape was a delight to read from start to finish and shows just how good Morris and Goscinny were when they worked together on the character. • There are more details of the English language Lucky Luke books on Cinebook's website. • There are more details on the original French language Lucky Luke on the official Lucky Luke website (in French). STRIP Magazine Issue 1 will now be on sale in UK comic shops from 2nd November. Diamond Comics have confirmed delivery of the delayed shipment from Bosnia and nothing should now prevent the monthly adventure anthology title's launch. A digital edition, produced in partnership with ROK Comics for iPad, is awaiting approval by Apple. In a statement, Print Media Productions say they will now be building more time into our production schedule to hopefully avoid this unfortunate situation arising again. • STRIP Magazine Issue 1 will now being on sale from 2nd November 2011 in all good UK comic shops. You should soon also be able to order single issues online from http://www.printmediaproductions.com/. I've just been reading a document recommended to me by a teacher. It is the National Union of Teachers guidelines for increasing 'Reading for Pleasure' across a whole school. In order to fulfil all these functions, there needs to be a wide range of categories of reading materials within a classroom library, for example: stories and narrative accounts, eg, fairy tales, folk tales, and biographies; picture books with thought-provoking images and examples of artistic talent; information books; computers with bookmarked Web pages, including major reference sources; miscellaneous reading materials, such as popular magazines, newspapers, catalogues, recipe books, encyclopaedias, maps, reports, captioned photographs, posters, diaries and letters; joke books, comic books, word-puzzle books; and student-authored books and stories. No mention whatsoever of graphic novels or manga titles and "comic books" are lumped in with joke books and puzzle books! Brilliant,eh?! Clearly the 'teacher' that wrote this has no concept of comics beyond Beano and Dandy! Even the description of "picture books" is a bit strange, as though the actual story/writing is of no consequence. • Note: NUT's advice for encouraging Reluctant Readers does suggest teachers "provide graphic novels, comics, manga, and picture books for older readers." 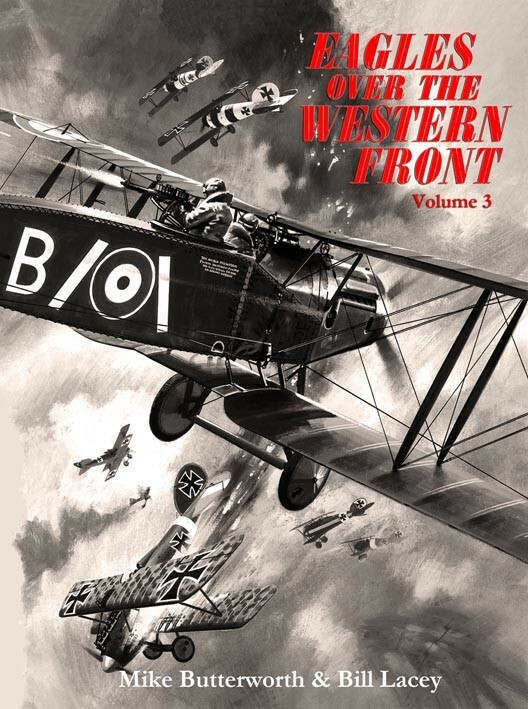 Steve Holland's Bear Alley Books brings the World War One story of Royal Flying Corps pilot Harry Hawkes to a conclusion in Eagles Over The Western Front Volume 3. It is 1917 and America has entered the war but for the pilots of No 2 Camel Squadron little has changed and the Red Baron is still their mortal enemy. A talking parrot, that has already visited the Germans and the French, joins Harry and his colleagues with its repetition of phrases getting them into trouble with their superiors before it finally reveals the location of a hidden German force. Things turn dangerous for Entwhistle as his younger brother, the black sheep of the family, joins the squadron and Entwhistle himself is put up on charges as he tries to prevent his brother's schemes. Harry, Entwhistle and Pootle all take part is a mission to land a British spy near Berlin using a British Handley Page Type O/400 heavy bomber but, when the spy breaks his ankle on landing, it is Harry and Pootle that must meet his contact in a small Berlin cafe. Eagles, originally published in Look and Learn magazine between 1971 and 1973, was written by the highly experienced comics writer and editor Michael Butterworth, who was also writing The Trigan Empire for Look and Learn at the same time, and illustrator Bill Lacey. The previous volume ran a detained feature on Butterworth's work and in this final volume the feature is on Lacey. This takes in his career from Mickey Mouse Weekly in the 1950s through to work for DC Thomson in the 1980s in Buddy, via titles as diverse as Super Detective Library, Tiger, Buster and Valiant. As with the previous two volumes, Butterworth mixes shorter and longer stories which means that the rhythm of the book never gets predictable while Lacey's artwork remains as clear and as remarkably detailed as before. His depictions of the biplanes are accurate and dynamic while his humour can be seen with his depiction of the invariably hungry Pootle. The volume offers multiple stories from the humorous to the serious and does not shy away from the fact that this is war and people die, both in the mud on the ground and, with no parachutes, in their burning aeroplanes. The one constant is the continual presence of Manfred Von Richthofen, the Red Baron, and his deadly Flying Circus whether at a distance as bullet spitting aircraft or when the characters meet in person as they do on several occasions. 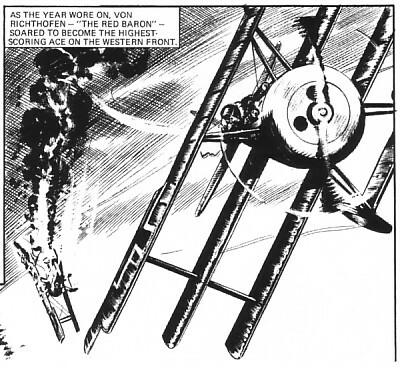 Indeed Eagles Over The Western Front as a comic strip is so involved with the Red Baron that the last story concludes on 21 April 1918, the day Richthofen was shot down and killed. For most of its readers Look and Learn was a parental-purchase magazine due to its cost and, while parents bought it for its educational value, most of its child readers would have started each issue by reading the comic strips before moving onto the factual features. 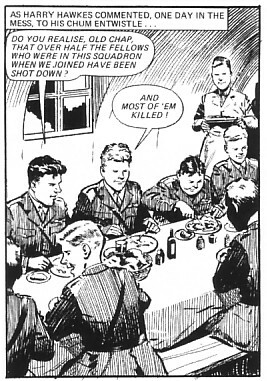 Strips of the quality of Eagles Over The Western Front were one of the reasons that they were more than happy to keep reading Look and Learn week after week. • There are more details on Eagles Over The Western Front Volume 3, as well as ordering information, on the Bear Alley Books blog. • The downthetubes reviews of the previous volumes are here and here. 2000AD has launched its first ebook collection of interviews with some of the biggest names in the comic book industry. 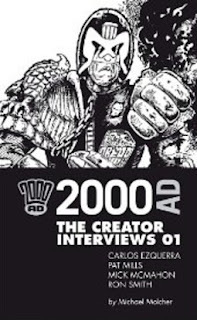 This first collection includes a three-part interview with the co-creator of Judge Dredd, Carlos Ezquerra, as well as pieces on the creator of 2000AD, Pat Mills, and two of the artists who fundamentally defined the look of Dredd – Mick McMahon and Ron Smith. In a new experiment for 2000AD, the series is being made available in ebook format, firstly for Kindle only – available through Amazon for just £1.99. These long-form interviews from the monthly Judge Dredd Megazine offer a unique insight into the life and work of seminal figures in British comics history, covering everything from their childhoods, to their time with 2000AD and their work elsewhere. Later volumes will include interviews with more top flight talent from the world of Tharg. “These interviews are one of the highlights of the Judge Dredd Megazine and give unprecedented insights into the creative minds behind 2000AD and its characters,” said Matt Smith, editor. 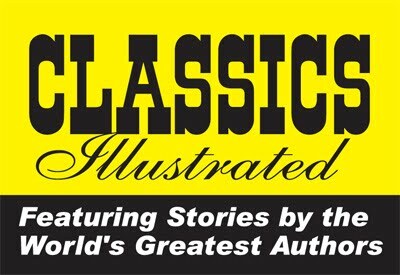 BBC Radio 4 FM are broadcasting a 30 minute documentary looking at seventy years of the American comicbook series Classics Illustrated on Tuesday 25 October 2011 at 1130. As the first issue, The Three Musketeers, was originally published in October 1941 and actor Bill Paterson presents the documentary marking the 70th anniversary of the series with contributions from Professor John Sutherland and British bookseller Jeff Brooks who revived the title in the UK using the original artwork. The UK Classics Illustrated comics are published by Classic Comic Store and the current issue is number 34, an adaptation of James Fenimore Cooper's The Last Of The Mohicans, which is available in WH Smiths, Easons and other high street newsagents. There are more details of the BBC Radio 4 FM documentary on the BBC website and we would expect it to be available on the BBC iPlayer after broadcast. 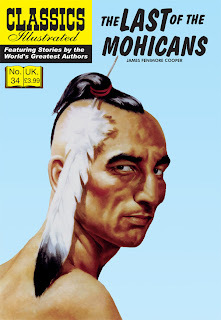 There are more details of the modern British publications of Classics Illustrated at the Classic Comic Store website. You can read an interview with Classics Illustrated publisher Jeff Brooks on the downthetubes main site.